Superior provides shower and restroom trailer rentals for campsites, arenas, sports fields and events in West Virginia. Our trailers are ideal for events including parties, wedding receptions, concerts and remodels and are available for short or long term rental, as needed. Well-maintained with a variety of convenient features, our shower trailers provide guests, workers or visitors with refreshment and comfort. Private shower stalls, open sink areas, large mirrors, and changing rooms make Superior shower trailers ideal for construction sites or high-traffic events like the Color Run. With large capacity water tanks, these shower trailers provide hours of hot water, even when an outside water source is not available. Superior restroom trailers offer cleanliness as well as a comfortable environment. Our models are equipped with features such as wood grain floors, heating and air-conditioning, handicap accessibility, stereo systems, and more. With the ability to accommodate a small outdoor picnic with 50 guests to an upscale outdoor wedding with 5,000 attendees, you'll be sure to find a restroom trailer to fit your need. 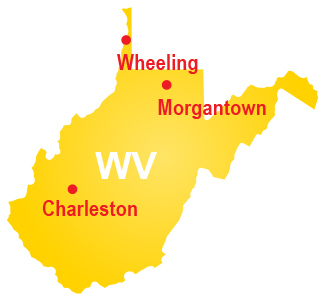 We provide service throughout West Virginia including Parkersburg, Morgantown, Charleston and Huntington. Contact us to request a quote.